No Bake Lemon Oreo Cheesecake – This dessert couldn’t be easier, it’s full of lemon flavor and perfect for summer. When I was in high school, my mom started making something that we dubbed Cottage Cheese Fluff. Now that I think of it, that probably wasn’t the best name because, well, it doesn’t sound all that appetizing. The recipe is pretty simple, cottage cheese that we buzz in blender until smooth combined with jello powder and Cool Whip. Mix it all together, let it chill and just like that you have a fluffy dessert with a little protein. Because that totally negates the Cool Whip – duh. My affinity for this fluffy goodness followed me to college. 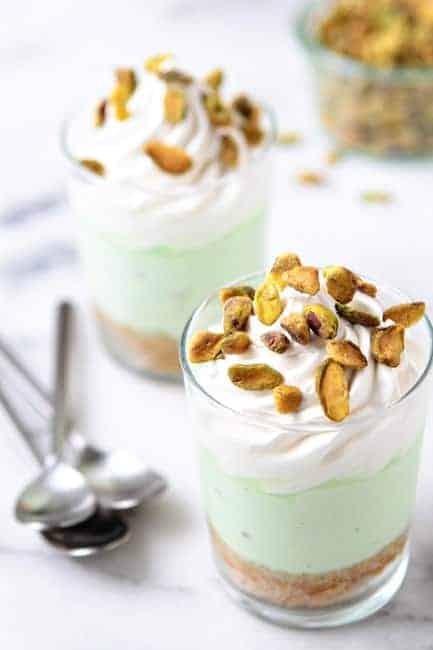 People thought I was nuts, but as soon as they snagged a spoonful of the stuff they’d be smitten – throwing out jello flavor suggestions and stocking the fridge with cottage cheese and Cool Whip. Every so often I get a hankering for mom’s fluff and I whip up a batch and happily shove spoonfuls from the tub directly into my face all week long. Lemon is my most favorite fluff flavor and last week I just so happened to pick up a bag of Lemon Oreos from the market. Eric isn’t a fan of lemon flavored desserts, so I’ll blame the purchase on recipe testing. And of course I just had to snag a few for – um, quality control. Have you tasted these? OMG they are amazing. I usually don’t go out binge buying Oreos, but I may or may not be hoarding a few packages of these in the pantry. Just sayin’. While I was snacking on a few cookies, I decided that they’d make an excellent crust, so I decided to whip up mom’s fluff, only I subbed cream cheese for the cottage cheese which created an ultra thick, fluffy No Bake Lemon Oreo Cheesecake that’s full of sweet, tart lemon flavor. It’s easy peasy lemon squeezy. Evenly divide the crumbs between your individual serving dishes and press into the bottoms of the dishes to form a crust layer. In a large bowl, with an electric mixer, beat the cream cheese until smooth. Add lemon zest, lemon juice and vanilla and mix to combine. Sprinkle the jello powder onto the cream cheese mixture and mix on medium-high speed until thoroughly combined. Using a rubber spatula, fold in the whipped topping until well blended and no streaks remain. If desired, garnish with additional whipped topping and lemon wedges. 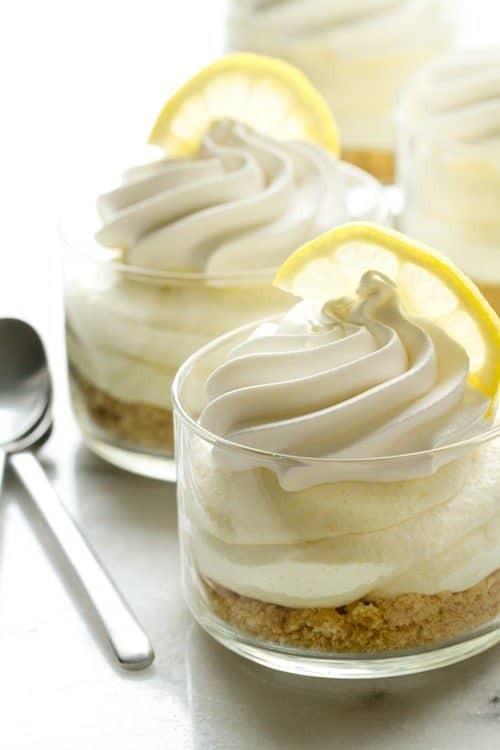 No Bake Lemon Cheesecakes are best served the day they are made. You can find frozen whipped topping (Cool Whip) in the freezer section of your grocery store. If you are not a fan of Cool Whip, Whole Foods sells a great alternative called Truwhip. It’s free of high fructose corn syrup, hydrogenated oils, trans fat and gluten. If you use freshly whipped cream in place of the whipped topped, your results may vary from what is shown here. I eat cottage cheese all the time, but I’ve never thought of doing b something like that with it! Sounds good! The cheese cakes look gorgeous! I’ll have to try those, too! 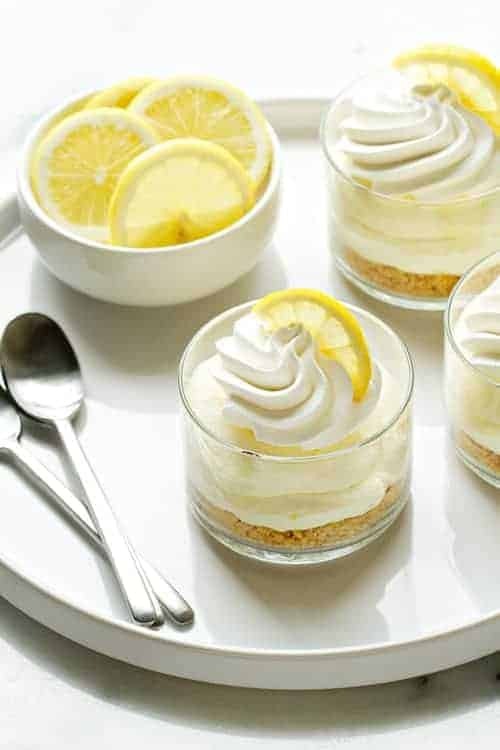 Amazingly scrumptious recipes, I will be trying the lemon cheesecake recipe tomorrow although I have saved some no bakes recipes to make with my grandson. Looooove the flavors happening here! I’ve been meaning to try the Lemon Oreo’s, so I think I just might have to pick some up and make these! Can you give me the proportions/amounts of cottage cheese, cool whip and jello. My girls love mousse like desserts and a little added protein never hurt anyone :). Thanks. All of these look absolutely amazing! Jamie, these look so summery fresh! I have a package of lemon oreos that have been sitting in my pantry for a couple of weeks and I didn’t have the slightest idea what to do with them, except eat them straight from the package. Not that anything’s wrong with that… Thanks for sharing! Man oh man I wish we had lemon Oreos in Australia – this dessert look absolutely wonderful!! 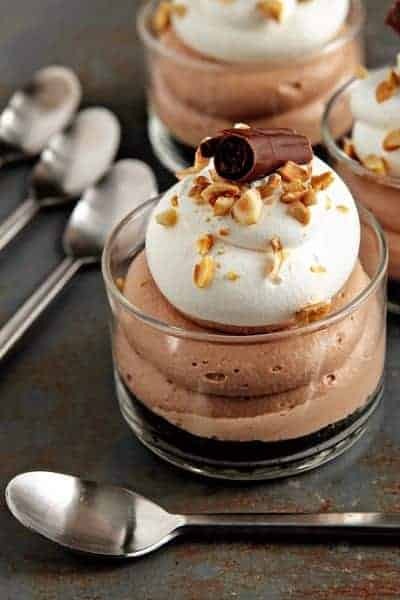 I love mini desserts – serving everything up in individual cups like this always makes them 10x’s cuter! These sound delicious! Yes, Jello is lemon flavored gelatin. Thanks for stopping by. These sound great. I’ve made lots of cheesecakes, but never with an oreo crust. Do you crush the entire cookie…cream filling and all? Thanks! Yes you crush the cookies filling and all. the lemon cheesecake sounds awwwsum..
what can i substitute d lemon jello with? You might use unflavored gelatin and add in some lemon juice or flavoring. I hope this helps. I’m so glad you all enjoyed it. Thanks for visiting. “cottage cheese fluff” was known as “pink stuff” or “green stuff” or “orange stuff” at our house growing up (depending on the color of the jello)! We still have it at every family gathering. You can really fool yourself thinking “cottage cheese is good for you”. So yummy! Looking forward to making these lovely looking lemon treats for my nephew and son who love all things lemon. I hope you do get the chance to try these and enjoy them. Thanks for stopping by. Love anything lemon! Made, all my……….DELISH :) Thanks! Hi, Sandy! 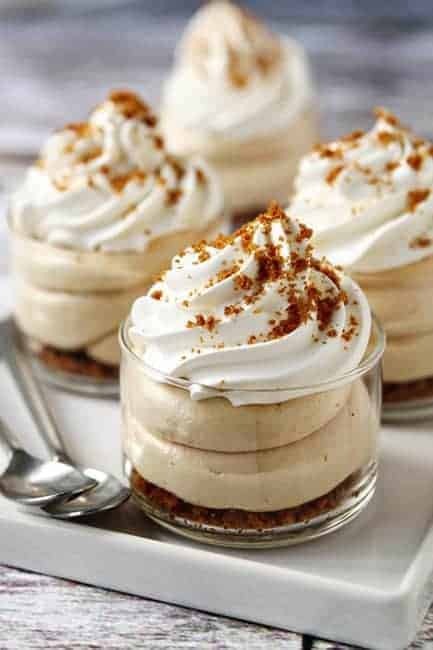 I’ve never made a cheesecake with cottage cheese, but the cream cheese in this recipe makes the no bake cheesecake super creamy and smooth. I hope you give it a try! Let me know how it goes. Just made these for a dinner party. The flavor was fantastic, very lemony, but very thick, not creamy. Would using less Jello powder make it more creamy? Loved the Oreo crust. Thanks. Would you double this recipe if you wanted to make it in a round cheesecake pan? Hello! It probably depends on how thick you want your filling to be. My No-Bake Oreo Cheesecake (https://www.mybakingaddiction.com/no-bake-oreo-cheesecake/) is made in an 8×8 pan and uses twice as many Oreos but a similar measurements for the filling. You could certainly double the filling as well, though, if you wanted to make sure you had enough, and simply put any leftover in ramekins for later. Hope this helps! Happy baking.